Anyone For A High Tea? Ok, even though the title almost gives it away, what am I posting today? First up, I am sure you want the recipe. I have had this recipe for ages and finally, fi-na-llyyy, discovered where I found it over 3 years ago. I know, 3 yrs is huge! 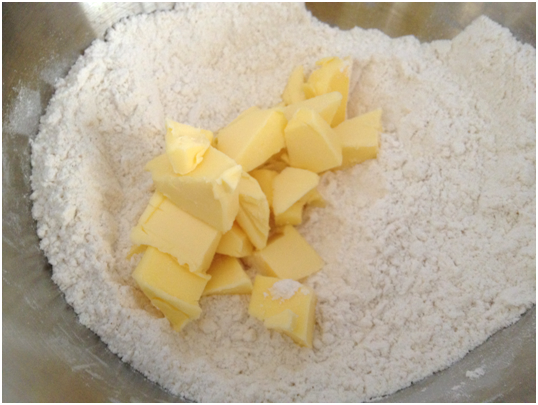 NEVER OVER-KNEAD, STIR ETC THE DOUGH – You know rock hard scones? That is how they begin! and of course, a PRINTABLE RECIPE! Feeling calmer? But to make sure you all receive your daily (or um every three-four daily) dose of chocolate as part of a healthy blogger diet, I am posting up a link and pic of an exceptional chocolate dessert I may have seen on my foodie adventures. Jokes Jasline, what a fabulous recipe! Cheerio for now! I shall see you on the weekend after my history exam is ancient, my english exam has been satisfactorially executed et mon examen francais est finir! THIS RECIPE IS FREAKKIN’ AWESOME, URU!! I love scones!! I haven’t made them in forever! You have inspired me to make some. Scones definitely are a favourite! Ooh I love a good Devonshire tea. Thanks for sharing the scone tips, think I might make some next free weekend ! Thanks and I hope you enjoy them if you try them! This takes me right to my childhood! My mom and I always had tea time 🙂 Your scones are superb!! It must be the secret recipe, can’t wait to try. I am glad you enjoyed both scone and story my friend! 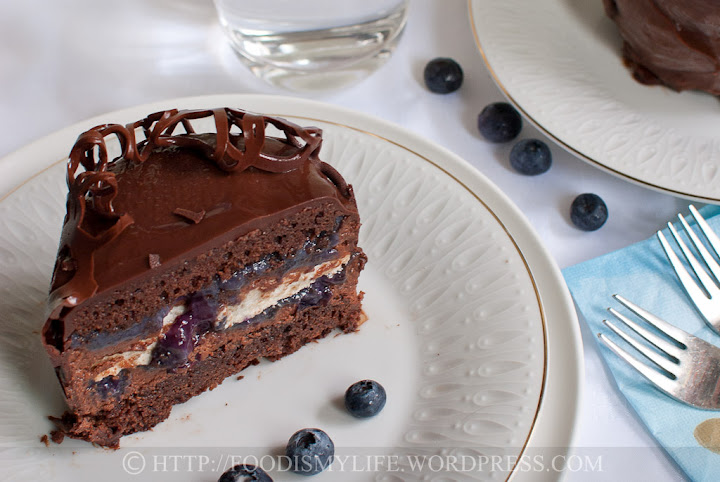 Hihi, it’s me, miss your blog, eh, I mean miss your cake, ngek ngek. Although I don’t bake, but, I’m still enjoy reading your blog and those food, awesome! Thanks for being so sweet my friend! Beautiful! And what a fun post to read. 🙂 I love the additions you made to the scones recipe, very smart and I’m going to try that too. Those scones look absolutely perfect. 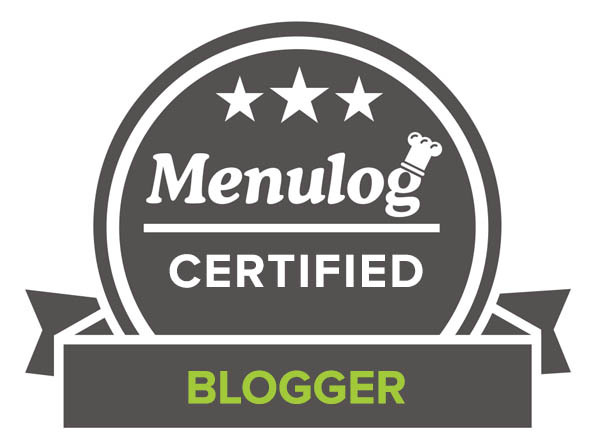 Thank you so much for connecting, I am so excited about finding your blog too! 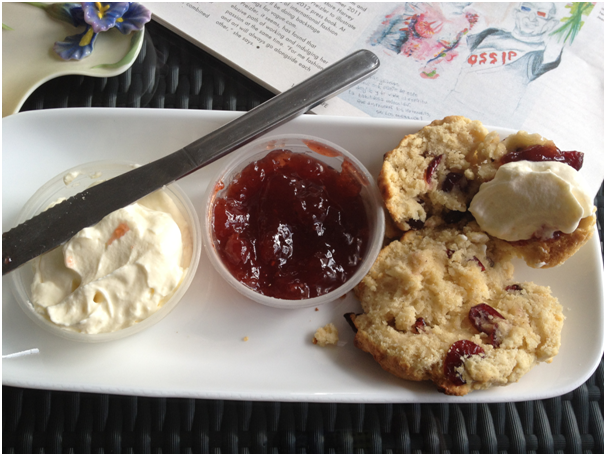 I like a little scone and tea with my clotted cream. I could live on that stuff. oooh! Best recipe, eh? I’ve got to try this then! I’ve made scone twice before and they turned out pretty great, but still not as great as my favourite scones ever from a bakery!! Gotta try this now! What a clever post! I am sure Lord Grey was stuffing his pockets with scones when he left. They look quite lovely. I am glad you enjoyed my friend! I love raisin scones and blueberry scones too! Pleasure always visiting you my friend! Was just thinking about High Tea today…for Mother’s Day! Looks amazing, now I’m thinking I should plan the tea party at home instead! Though a tea party afternoon sounds like a paradise as well! 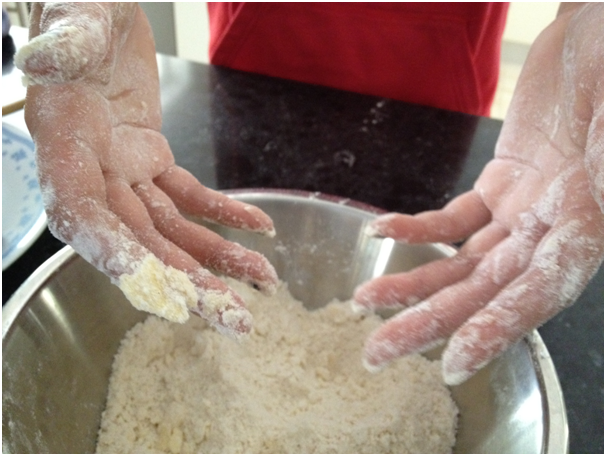 I’ve always wanted to try my hands at scones but just have not gathered up the courage yet! Fabulous job Uru. I would soooooooo eat those delicious scones you made. Well done. Baking is yummy even without chocolate (and especially if you bake scones)! You are definitely one of the funnier people I know! I LOVE the British accent, in fact, one night during my college years I spent an entire evening speaking in that accent because I loved it so much. I’m such a dork. Love the recipe too! Glad you enjoyed these my friend! LOL!! What an entertaining mind you have!! I love the whole conversation, spot on! 🙂 These scones look so amazing, especially with the jam & a bit of cream on top! MMM I think I have to have one of these immediately! YUM!! I have yet to bake scones, but when I do, I will use your baking tips. Thank you for enjoying my friend!! I must be super British since I am British and love scones, yum yum! Would you like me to put on my best Blighty accent and read out your dialog for you to laugh at? hehe! Scones are a favorite breakfast treat of mine! THese look like the perfect way to start the day…or to accompany a cup of tea! lol u certainly have a flair with story writing 🙂 the scones look crumbly and delecious.. all the best! But even more happy you enjoyed these scones! Appreciate the luck my friend! I love scones!!! I havent made them in some time now. I know what I will be making tomorrow! That looks awesome paired with cream and jam! Nothing could be a better trio! I have always wondered how to make scones, read about them so much in children’s books. Now I know! It looks difficult, so I shall attempt it when I am well and truly up for a challenge. As for the rest of the post (in my best Brit accent) simply maah-velous, daahling! Did I tell you how much I love reading your posts? You are really talented my friend and coming here is a real joy. I was looking forward to your scones post and you never disappoint. Oh, I have such fond memories of Devonshire Tea during family drives out into the country during holidays! And extra fluff for sure! Scones are definitely hard to nail, but when they’re done right, they’re oh-so-delicious with that crumbly exterior and the fluffy interior. Now these look like they were made perfectly. If only I could grab one of these babies from the computer right now. Your scones came out perfect! I love craisins! Those scones are definitely a thing of beauty! I love that you scones in such a light! Your scones look absolutely perfect.Reminds me of the time I spent in England! !I love the texture of these and cannot wait to try :)Thanks for sharing U! Can I come for tea, please? 🙂 Your scones look lovely! I have to keep my eyes open for clotted creams, maybe in shops that sell European goods. I love scones, and these look fabulous with the jam and whipped cream. Wish I could down to a plate of these for tea time today! Give me this over cupcakes any day. Yum. I would go to high tea just to enjoy these treats lol. I mean wow.. I absolutely love this. Would you believe I am having friends over for tea on Sunday? There must be scones, and I’m going to keep your recipe in mind. These look delicious! I love scones more than muffins or cupcakes and your scones look fabulous. I had never had them with cream! I bet it makes it extra delicious! ha! ha! Very funny! I’m not British, but I adore scones! And I admit I like lather on a bit of cream cheese on it, too! WOW! Your scones look incredible! Thanks for making sure WE will never have hard, dry scones. That would be a terrible shame. Thanks for this recipe and have a great week! Gorgeous scones, CCU, plastic cups? What a beautiful cake as well, that gnache on top is incredible. Good luck with the exams. I love the cake as well, it is mouthwatering! I love scones but not the hockey puck version. This looks wonderful & perfect timing since I’ve had a craving for them lately. Recipe I’ve concocted from a couple different ones uses sour cream & a little bit of heavy cream in them but this will be my go to recipe. Thanks for the tips but did you forget to put a “pip-pip” in the dialogue? YUMMY!! 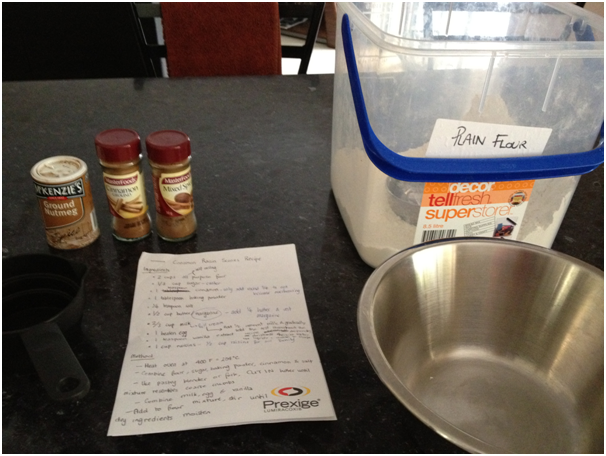 I am ready for High Tea….start baking, I’m flying over! Love the recipe and the pictures! Great job! I love this post, as my husband and I will be flying into London to backpack through Europe in just a couple of weeks. I hope to have some great photos and stories to share along the way! OMG this is making me so hungry – I can almost taste the buttery, flakey, and warm scones. That chocolate cake looks dElicious! Yum! The scones look amazing, and so does that cake! And I agree, the cake is a sensation! Beautiful scones! I was a full on scone addict when pregnant, and I know a good scone when I see one. 🙂 Wish I could have indulged at your tea party! Wish I could have had you over for a tea party too! oh I would love this any time of day! looks so good! Thank you for enjoying the post today my friend! What a fun post! and the scones look delicious. an enjoyable read, indeed! Hello my friend! I want to say that this article is awesome, nice written and come with almost all significant infos. I would like to peer extra posts like this . I am glad you thoroughly enjoyed yourself! Hello, fellow chocolate lover. Watch the skies, err… I mean my LJ, for a future chocolate cheesecake post. Not quite as stunning as the cake with blueberry curd you posted the link to but it tastes pretty good. 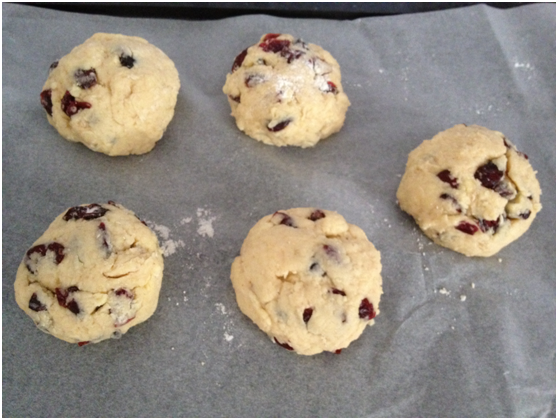 As to today’s scone recipe, I really wish I had more of a fondness for sweets over savouries. I have to give away most of the desserts I make. The savouries get given away as well but it’s easier to find a good home for sweet baked goods. I’ve never had clotted cream. Can one make something similar tasting in the home kitchen? If you are having trouble giving away sweets, I welcome them with open arms, truly I am here for you 😛 – if that is an issue, I am sure if you continue reading my posts I can convert you to the dark, err, I mean sweet side! I was hoping there was a way to replicate clotted cream here in the wilds of southwestern-Ontario (Canada). The practice of cream teas etc seems so elegant. I made a lovely mixed citrus curd recently which I served with lemon-poppyseed madeleines and a cup of tea. And here’s a picture that didn’t make the post. Love your tea party! And scones are a little tricky but well worth the trouble. I love scones with clotted cream!!!!!!! This post just made my day. Yes, I would like to have high tea now after seeing these scones. Picture perfect and enticing. Also, the cream and jam is a must.. I really love everything about this post. I love how fun it was to read, the tips, the recipe, and on and on. But my favorite thing about it is the idea you’ve given me to do a tea party with my oldest granddaughter. She’s 7 and just LOVES to cook and wants to me teach her how to cook some things she can make for her mom, dad, and little brother. Your scones are on the list, and then she and I can have a tea party together to enjoy them, practicing our English accents. She will LOVE it, and so will I. Thank you! And your idea is fabulous! I think a tea party complete with your granddaughter’s baking and that too being scones will just be too adorable and fun! Seriously! I need to make scones! Like, really!!! These look so simple and tasty to make. Love the dialogue by the way LOL! You really went in on the accent …”Oh Poppycock” and you’re instructions are on point. Thanks Uru!!! Scones! I love them, and haven’t had one for ages. And I love clotted cream. Good recipe, good post – thanks. 1. I love the story. 2. Wow, that’s a big container of flour. 3. Scones, Yum! 4. I absolutely adore tea parties. I collect tea pots, and I’m having an Alice in Wonderland themed tea party for my bday this year. 4. These scones look incredibly moist, tender, and buttery. 5. What a cute tea cup. Seriously, just darling. 5. I am so glad you enjoyed these scones! 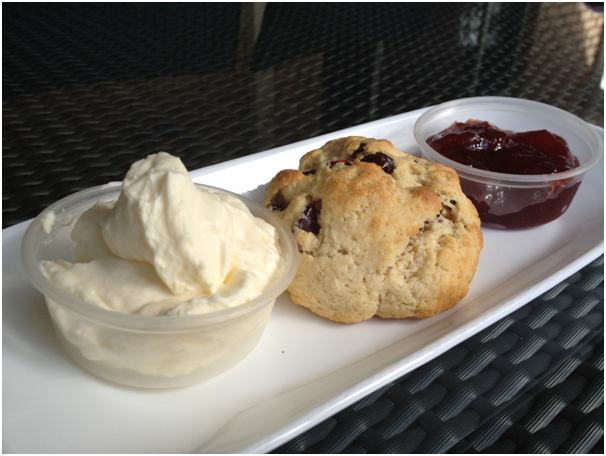 High Tea with you PLUS these scones – yes please! Thanks for enjoying the scones my friend! Ha! love this post! I needed a chuckle this morning. 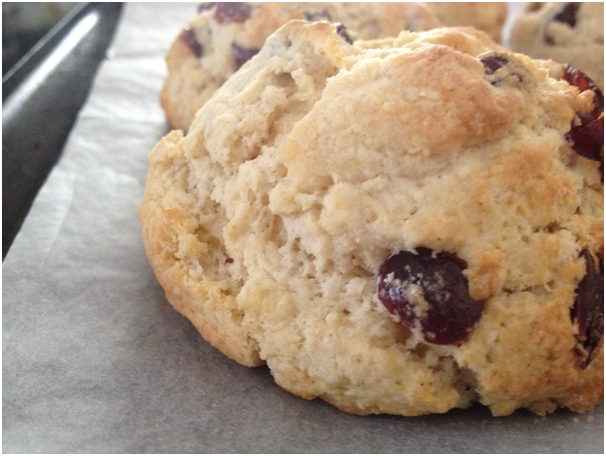 These scones look incredible, and I love your tips…very helpful! You are too darling to compliment me ever so much! ahahahaha.. is buttle a word? You crack me up!! 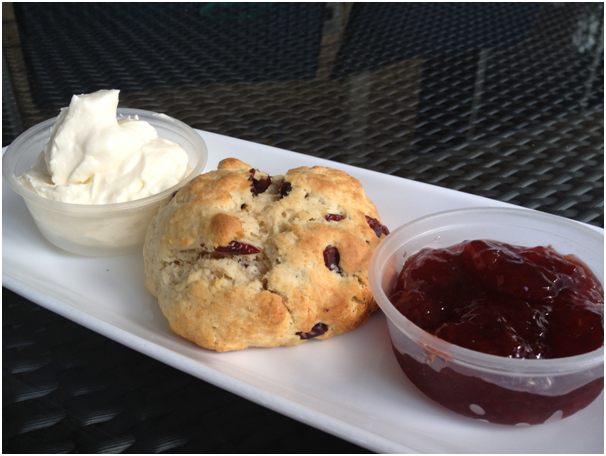 Scones & tea – can’t go wrong w/ that! My fav Earl Grey is the one from Adagio Teas. I just LOVE that stuff! I leave your blog always the same way…hungry. You are so clever with words, always enjoy reading your post and with a smile. Thanks for all the helpful tips for making a great scone. Look wonderful and moist! Perfect for high tea! That was nice run up in your sharing on the scones and I am trilled to read that spicy went inside these scones. Looks lovely with the pairing you did. Delicious!! I love scones, especially with a lovely fruit and spice combo! Great post too! And I’m with you – I love spices and fruit together! My gosh Uru- how entertaining are you! I’ve made scones before but never like this, Devonshire accent, theatrics, the whole nine yards -very ,very nice post my friend. ♥ it ! And you are more than welcome – enjoy my friend! 🙂 your scones look really good, with crispy outer skin! Believe it or not, I had my first scone just one year ago. What had I been waiting for all that time, I do not know, because they are amazing!! Yours look perfectly light and delicious. O.K., you got me. I put on the English accent…as we American love hearing…and read your script! 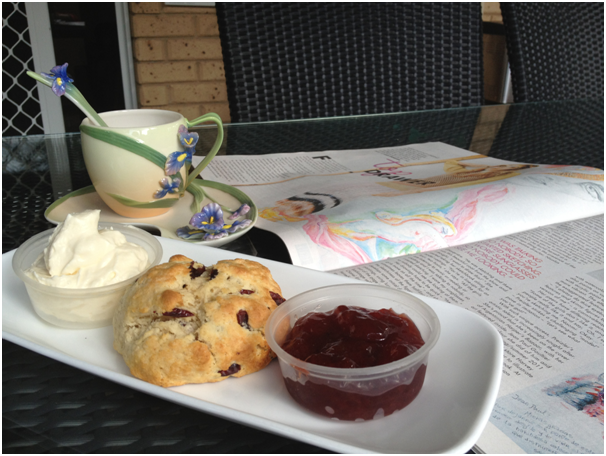 We adore scones and they always bring back memories of our times in England. I am definitely book marking it! I’d love high tea if it involves homemade scones! Yum…. Tea time is so much fun. I used to have them weekly in college. Scones are delicious and yours look great. I love the big tub of flour. Thank you for enjoying my scones my friend – I too understand the frustrations! 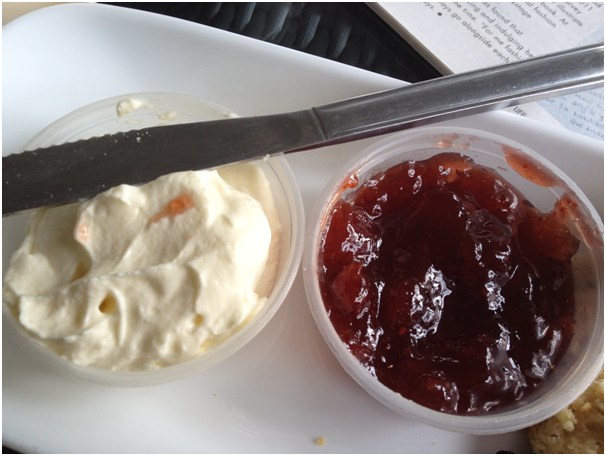 Even in Australia, some scones are rock hard, so many given with canned frostings – it makes me want to ask where the love is in the food!!! CCU, I love Jeeves and Wooster, too! I’m sad, though, because “House” is at an end. Can’t wait to see what Hugh Laurie does next. It sounds like your tea party was delicious. I love this post 🙂 i have a recipe to feature on my blog for ‘Earl Grey Cupcakes’. They would have been perfect for your tea party ! Thank you 😀 – I hope you enjoy these scones (which I highly recommend ;)) and find the tips helpful! Enjoyed your Devon shire tea party, even though only family members were invited 🙂 the scones look just perfect with my favorite whipped cream and jam. Love reading your posts and now i will try to be regular. The scones look amazing! And I love the tea mug set!!!!! Where did you get it? I would love to buy it online, please, let me know. I am so glad you liked these, thank you! Spiced scones are my favourite, even over the traditional! Thank you so much – Wish I could invite you virtually! I can always say the same about yours! I want a scone right now, but am too lazy to move from the couch. Also, you’d best believe that I most certainly read the first portion of your post in my best posh accent. haha, absolutely. Be there in, what, 17 hours? I hope you sincerely enjoy it! these spiced scones look so delicious, I would love to have one with my afternoon tea! Thank you so much! I hope my tips help! Once again everything looks wonderful but I have to say that I just love all the work and creative thought that you put into each of your posts. Beautiful post, love high tea and the scones are perfection, they look so tender and moist and light. I am the queen of the rock hard heavy undigestable scone and biscuit. Must try this recipe. Ha! no throne here. Your scones are amazing and as soon as I get off this diet and reach my goal this will be the first thing I make! 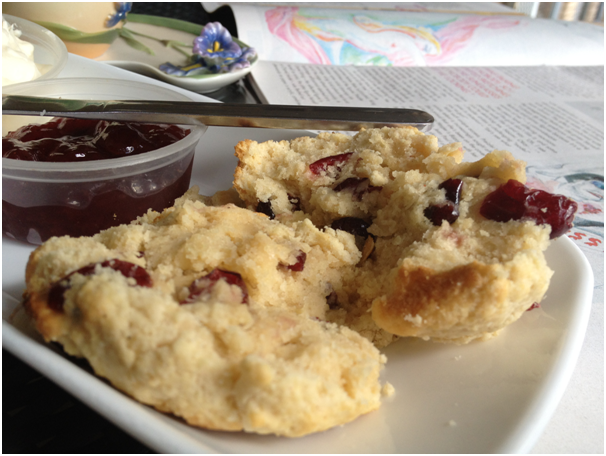 Your scones look marvelous … Best wishes on your exams, this week! And thank you for enjoy my scones and Jasline’s amazing cake! Looks lovely! Thanks for the tip about triple sifting dry ingredients, I will try it! I like the look of your “craisin” scones with the cheerful red bits. I’m making shortcake today. And can you believe I’ve never had clotted cream?? I’ve never made scones before but my roommate has and it is definitely quite a process. I come over for tea! These scones look fantastic! I love this post! 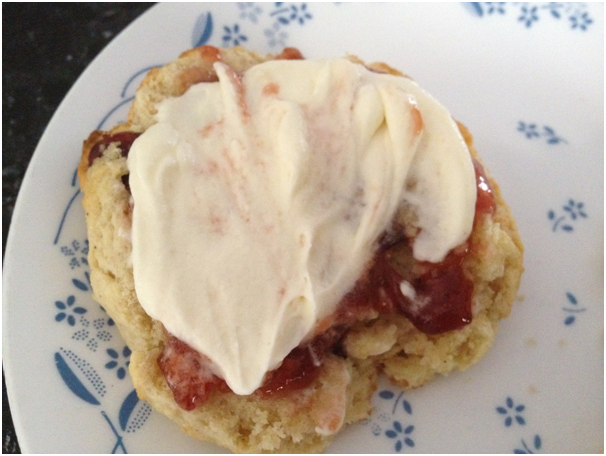 Living in Cornwall, I always makes scones for visitors and serve with (usually homemade) jam and Cornish cream. Yours look absolutely fabulous and make me want to make some today even though we have no visitors!! And I am so happy you enjoyed mine – it means a lot! And giving good comments is the only way to go my friend! Fabulous scones, darling! Perfect to get your English high tea fix 🙂 Especially smeared with that lovely clotted cream! I love the recipe and especially how you presented the entire post. Oh you are too funny! A tea party sounds like a fabulous idea and the scones look just perfect! No ways, I was just saying I want to make scones today! Great minds, I tell you.